Jump to: Using More than Four Modules - now works with 10! I have been experimenting with the 8x8 LED matrix display modules like these from BangGood: http://www.banggood.com/MAX7219-Dot-Matrix-MCU-LED-Display-Control-Module-Kit-For-Arduino-p-915478.html - they utilize the MAX7219 to control the 64 LEDs. I got the unit working with three 8x8 modules and have been quite pleased with the ability to program a message on the Arduino and have it scroll by. My next goal was to take the output from a PIC or PICAXE microcontroller, something that I am very familiar with, and have the data (perhaps room temperature or other information) scroll on the display. At first the two devices were none too happy about communicating via RS-232 serial - I found the following program for the PICAXE works well. The serial output from the PICAXE is at pin 5. This connects directly to the RX input pin on the Arduino. The first two "32"'s should NOT be changed. They have to do with the ASCII values of the characters, not their being displayed. If you do change the second set of "32"'s you will see your lower case letters displayed in upper case. Other errors will show up as well. To work with up to 8 modules change the 2nd two "32"'s to 64. I continued to add modules by changing the "MaxInUse" variable. Again, I ran into errors on the display. I gave some thought to the value of 64 that was used to get to 8 modules and guessed that this value might need to be 8 times the number of modules so I changed it from 64 to 72. Bingo! The 9 module display worked like a charm. I never got more than 8 modules. This code it is correct and works up to 9 modules. Put a value grater than 80 like e.g. 100. The results are in and the changes allowed me to get 10 modules working! I haven't tested beyond that but expect that more will work. The two modified files can be downloaded here - be sure to back up your original files before changing to these new ones! Just use them in place of the files in the library location on your computer. Note that I also changed two items in the section below to 80. Here are the 10 modules all wired together. The +5 and ground connections are at the bottom of the boards and the others are at the top. Here is the bottom of the boards. The back shows the yellow Data In / Data Out wiring from one module to the next. This photo shows the heavier wire that was used for the power and ground leads. Another YouTube Demo Video with a Case! Modified Code - Added Functions! The code here adds static pauses followed by clearing the screen and flashing of the display. for (int x=0; x <flash; x++)  // careful not to put a ; after this!!!! 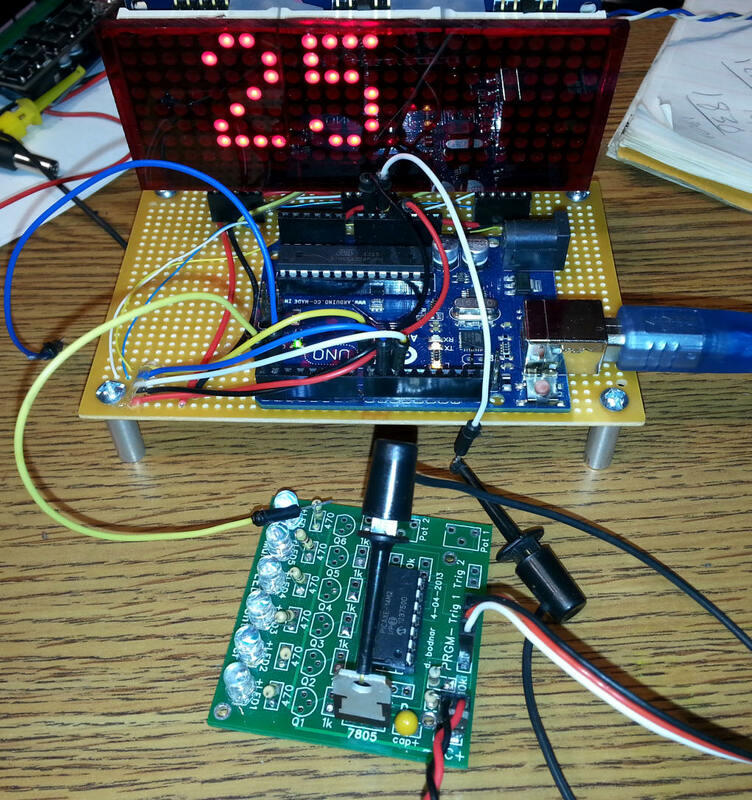 16F88 program to test output to Arduino - the following works! NOTE - Must remove cable to RX on Arduino to program it!